If you’re wondering why your life seems so stressful and are trying to figure out why, you might want to take a moment to look at yourself because YOU might actually be the major reason behind all the stress you’re having to deal with on a daily basis. Life will always find a way to throw curve balls at you, inevitably making you feel stressed from time to time, but if you don’t watch the way you think and act your habits will amplify the stress and make it harder to cope with daily stressors. Here’s a list of 7 habits commonly exhibited by people who claim to be perpetually stressed. If you’re the sort of person who often feels drained at the end of the day, no matter how uneventful the day might have been, you’ll probably find yourself checking one item after another on the list below. 1. Negative thinking – If you don’t think much about what you think and how you think, chances are that you also fall prey to negative thinking. Think about it. What comes to mind first when something doesn’t go your way? How do you talk to yourself when you make a mistake? If your thoughts automatically turn to the negative, then you can be sure that this is adds to your daily stress levels in a major way. You need to re-train yourself to be a positive thinker and change this bad habit starting NOW. Yes, you’ve got to start now and stop thinking that it’s too hard and start by telling yourself that you can do it. Remember, positive affirmations to yourself goes a long way! 2. 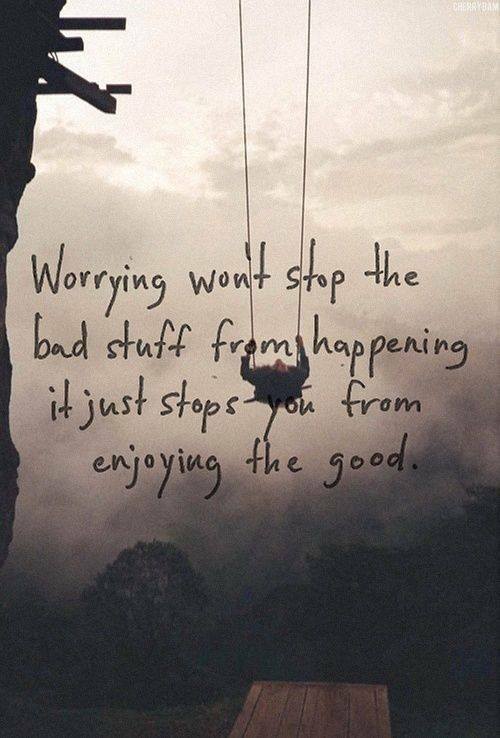 Worrying – Everyone worries, but if you’re making a second job out of it, then you need to stop. As the quote below says, it won’t do you any good! I find that one of the best ways to stop myself from worrying is to ACT so do what you can to address an issue when needed and if possible, but if you can’t do anything at the moment then decide to put it out of your mind for the moment. In cases like these, your next best bet is DISTRACTION. Get busy doing something else, and before you know you’ve have stopped worrying without realizing it. 3. Procrastinating – There’s nothing like an unfinished task to make you restless. Of course, there’s no way to get everything you need and want done all at the same time, so get the important things done first to make the rest of your day go easier. The longer you put off things you don’t really want to do, the longer you make yourself suffer from anxiety over the matter. So try your best to prioritize and meet your own deadlines, and in case you fail to do so… at least go back to #2 and stop worrying. 4 – 5. Poor eating and sleeping habits – Your eating and sleeping habits are lumped together because they both affect you physically. Skipping meals and not getting enough sleep or not sleeping and waking up at approximately the same time each day may not seem all that related to stress, but the toll this places on your body is something that directly affects how you feel every single day. You might think that the crazy driver who keeps swerving or your overly cheerful co-worker is what’s making you cranky, but it is probably your body telling you that you’re dehydrated, hungry or need some rest. Be good to your body by eating well and getting a good night’s rest, and you’ll be surprised at how much it will affect your ability to deal with stress. Not enough sleep leads to a stressful day at work! 6. Perfectionism – Ever heard of the phrase “only human”? Well, that is exactly what you and everyone else around you are. So cut yourself and the world at large some slack. Doing so will free you from unreasonable expectations that cause you to be stressed all the time. Aim for excellence but learn to take pride in your work and enjoy life even when things are not perfect. This, like positive thinking, is a habit of the mind and is all about mindset, making it a battle only you can really fight. 7. Constantly comparing – Whether you’re comparing yourself to others or your life now to your past, you need to stop this destructive habit. Comparing will only make you envious, unhappy, regretful, and fearful. The only acceptable comparison is perhaps when assessing yourself on whether you have met goals or not. Even then, you’re not supposed to do it constantly but only to check on yourself once in a while. There’s no real fix to this bad habit, except to STOP. And yes, maybe you can replace it with moments of appreciation where you think about what you have to be thankful for and take pride in what you have achieved. If you stop the destructive habit of comparing, you’ll not only find your stress levels going down but perhaps you’ll even learn to enjoy the good life now. Are You Giving Too Much of Yourself in Your Relationships?